As a seasoned researcher, I wanted to take on a research project that was the challenge of all challenges, a project that no one else thought could lead to useful findings. After dabbling with one project idea after another, researching how Parkinson’s Disease can be healed from the inside out has become my passion. Parkinson’s Disease has profoundly affected my family. My mother had Parkinson’s. My uncle had Parkinson’s. I accepted their fate at the time, a fate that doctors said would inevitably lead to perpetual decline and illness. Everyone said the same thing: Parkinson’s Disease is a degenerative disease. You don’t get better. One day I woke up and the insight flashed: It is not true. People can heal from Parkinson’s. The body does know how to heal itself. I launched an aggressive research program to identify the therapies, modalities and approaches that are helping people with the symptoms of Parkinson’s. I stumbled on people who are symptom free today after experiencing symptoms that were debilitating. In celebration of these discoveries, I have written several books about Parkinson’s. The Pioneers of Recovery series features individuals who succeeded in reversing the symptoms of Parkinson’s. 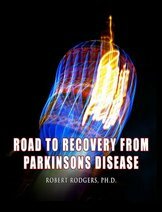 Road to Recovery from Parkinsons Disease documents discoveries about the causes of neurological symptoms associated with Parkinson’s and the treatments that people report have been useful in reversing symptoms. This research excites me more than any research I had ever done. My research has revealed person after person is taking positive action on one suggestion or another. As a result more and more people with Parkinson’s are feeling better. These are exciting times to be alive. One puzzle continued to flop around in my mind. What is the root cause of Parkinson’s? Toxins and trauma are clearly factors. Still, I asked myself, is there something deeper here – something at the core of it all – something that causes the neurological system to misfire day after day? The answer to the puzzle came to me in a flash of insight. Thoughts are the most powerful force in the universe – more powerful than nuclear power, more powerful than the combined weapons of all the armies in the world. Thoughts can heal. Thoughts can also create illness. We make choices every moment about what thoughts to have and what thoughts to shed. This profound insight gave birth to Five Steps to Recovery, a book that identifies the five critical steps that are necessary to transform thought forms that do not serve your best and highest good. What is Five Steps to Recovery All About? 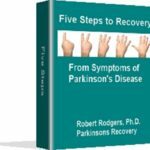 Five Steps to Recovery is a 272 page, fully illustrated book that explains the five critical steps that must be taken for anyone to sustain a reversal of Parkinson’s symptoms. What are the five steps? The five steps are certainly not tightly kept secrets. Taken together, they constitute the fundamental principles that are essential for manifesting anything – wealth, love, happiness, health – you name it. These past months I have worked on the five steps diligently for my own benefit. Some steps were a snap for me. Others were not. I needed extra help to transform my own thought processes. Since I struggled with some of the steps, I knew other people would too. I also took on the project of recording meditations to support and reinforce each of the five steps. To be perfectly clear, I launched this project to help myself. I shifted the focus of my work through Parkinsons Recovery when I realized how much the steps help me personally. I am confident a transformation of thought forms will also be a huge benefit to other people. They help me mold the powerful principles of each step into the fabric of my thought patterns. They transform the negative thought patterns that jostle around in my head. I have always wanted to make a large contribution to the research world. My prior research as a scholar has certainly been well received. Other researchers cite my published articles. But in my humble opinion, the body of my research has not made a significant contribution to the world of science. What will be the difference that makes a difference for me? Help thousands of people with the symptoms of Parkinson’s feel significantly better! Five Steps to Recovery is one of the contributions I have proudly make to support this lifetime goal. 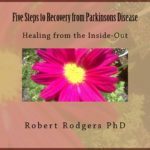 Five Steps to Recovery is the foundation for anyone’s recovery from Parkinson’s Disease. Cleanses cells of negative thought forms – Everyone has been assaulted with negativity in their lifetime which gets trapped in our bodies. Meditations provide ways to release negativity at the cellular level and cleanse neurological networks. Five Steps to Recovery helps to purge the negative thoughts that hang out in the sewers of our minds. Illustrates the power of positive thoughts – Negative thoughts have low frequencies that aggravate existing symptoms and cause new symptoms. Positive thoughts have high frequencies. They help us manifest health and wellness. Positive thoughts make it possible to heal from disabling symptoms. Supports ways to maintain positive thoughts every waking moment – We all have thousands of thoughts every day, most of which are recycled from the previous day. Change the vicious cycle of negative thinking that nourishes the symptoms of Parkinson’s. Nourish your body back to health instead. Provides guidance about the devious forms our thoughts assume – It is easy to convince ourselves that we are being positive when our thoughts are really making things worse. Five Steps to Recovery explains how to recognize, catch and transform the thoughts that drag us down into a stagnant state of illness and decline. Offers reinforcement for the powerful influence of the five steps – It is one thing to read about a step and understand it mentally. 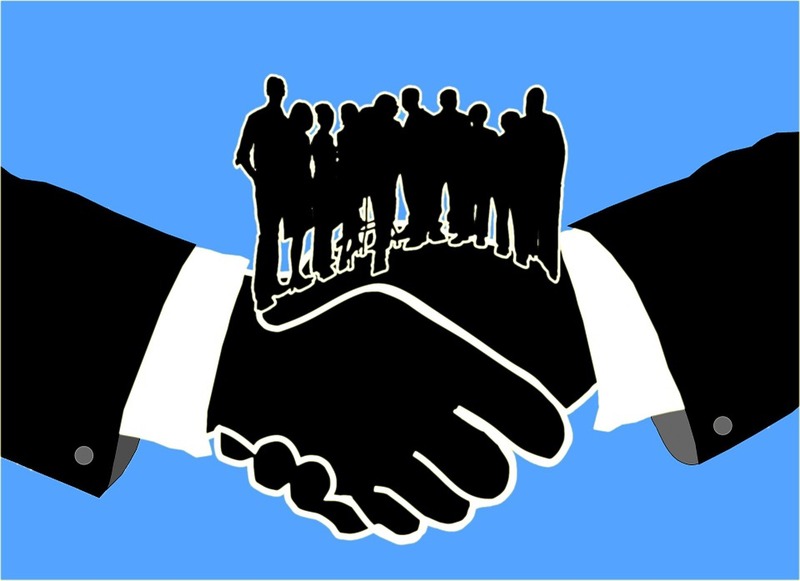 Review the list of five steps and you get the gist of what they are all about. It is quite another thing to absorb the idea in our bodies. Five Steps to Recovery meditations reinforce the limitless power to heal that is possible when you assimilate the steps in your body, mind and spirit. Inculcates the true meaning of the five steps in body and mind – Meditations are visceral experiences. You are taken on journeys that open up a profound understanding of how the thousands of thought snippets affect our health and well being. Energizes your life force – Symptoms of Parkinson’s can easily sustain you in a stuck place where no improvement seems possible. Meditations take you out of this dark, dreary place. They infuse your spirit with profound hope for a better tomorrow. Rekindles your creativity – Thoughts can easily cut ourselves off from the truth of who we are. Each of us has unique gifts and talents. Meditations introduce new and exciting ways of reconnecting with those gifts. They spark creativity. Rediscover what gives you joy. Remember what charges your spirits. Get a burst of renewed strength and stamina. Learn everything about right thinking that infuses you with limitless enthusiasm for life. Discover how your thoughts affect everything, especially your symptoms. Learn ways to hold and sustain positive thoughts throughout the day. Acknowledge the devastating impact of negative thoughts. Feel the energizing thrust of positive thoughts. Find simple, short exercises that are designed to nurture positive thoughts and release the negative ones. Celebrate the power of thoughts. Monitor your moment to moment thought forms. Some people on the road to recovery begin feeling better within weeks, but revert back to having problems several weeks or months later. Recovery for other people is much slower. Still other people plateau and can’t seem to wiggle their way out of symptoms they currently experience. I have observed that people who experience sustained recovery have the special ability to be positive and upbeat. They are convinced that anything is possible. An underlying factor that clearly aggravates symptoms is the persistence of negative thought patterns. Seeds of these negative thoughts sprout the symptoms. Some negative and destructive thoughts are not even conscious! They whisper at us so quietly we cannot quite make them out. Of course, our body always hears them even when our minds do not. I wrote Five Steps to Recovery to help transform the negative thought patterns that are so difficult for all of us to shake off. When I saw how much these ideas helped me, I knew they would have a profound impact on others. Once the negative thinking is transformed, great strides in recovery are possible. The door is open for recovery to flourish. Five Steps to Recovery is available in three formats. Some people are visual. Other people are auditory. Still other people are both. A print book and desktop (or download) book is available for people who prefer to read the information. Recordings of the meditations are available for people who prefer to hear the information. Both formats are available for people who take in information through both their eyes and ears. The 272 page paperback book contains full explanations of the five steps with transcriptions of the applicable meditations. When you order the print version of Five Steps to Recovery for $27.50 you will receive the print book in your snail mail mailbox 7-10 days after submitting your order. Click on the book cover to order your copy. 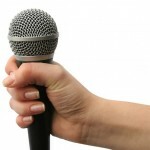 To order 4.75 hours of Five Steps to Recovery meditations click on the microphone. You will immediately receive a download link in your email and can start listening in five short minutes from now. DESKTOP BOOK (COMPUTER DOWNLOAD) PLUS RECORDINGS ($40). Click on the book below to order the download of Five Steps to Recovery and downloads of the meditation recordings. The 272 page desktop book (a book you can download to your computer) contains full explanations of the five steps with transcriptions of the applicable meditations. When you invest in a desktop version and meditations from Five Steps to Recovery you receive links to the download pages for both the desktop book and meditations. You can save the desktop book and meditations to your computer for review later or return to the download page whenever it is convenient to access the book and meditations. Desktop books are in PDF format to insure safe downloads to your computer. The best part of a desktop book is that you can read the book on your computer (or other portable device) in just a few minutes from now. There is no need to wait for the mail carrier to show up at your snail mail box next week. Following is the Table of Contents for Five Steps to Recovery which lists the content of each chapter and the topics of the 34 meditations. The length of each meditation is reported in (minutes:seconds) next to each mediation. If you see for example (34:23), it means 34 minutes and 23 seconds). When have you had Faith in Your Life? How Can I really Know what is Helping if Sometimes I get Worse? People tell me that I should be charging hundreds of dollars for this work, but the purpose of creating the book and recording the meditations has nothing to do with money. It has everything to do with helping people who currently experience the symptoms of Parkinson’s feel better. My true reward comes when I have been able to document the successful recovery of thousands of people with the symptoms of Parkinson’s who have transformed their thought patterns. This is the work I have been doing on myself and I am here to tell you that the exercises and meditations have worked miracles on my own ability to manifest energy, health and happiness in my own life. I have written many articles that have appeared in many prestigious journals, but Five Steps to Recovery is one of the best books I have ever published. I know the principles in the book will help you because they have a profound influence on my own life. Can you feel my own life force bleeding through these words? P.S.-The price of the book and/or meditations is equivalent to a dinner out for two. Stay home instead, prepare a healthy meal, and begin reading the book and/or listening to the meditations.